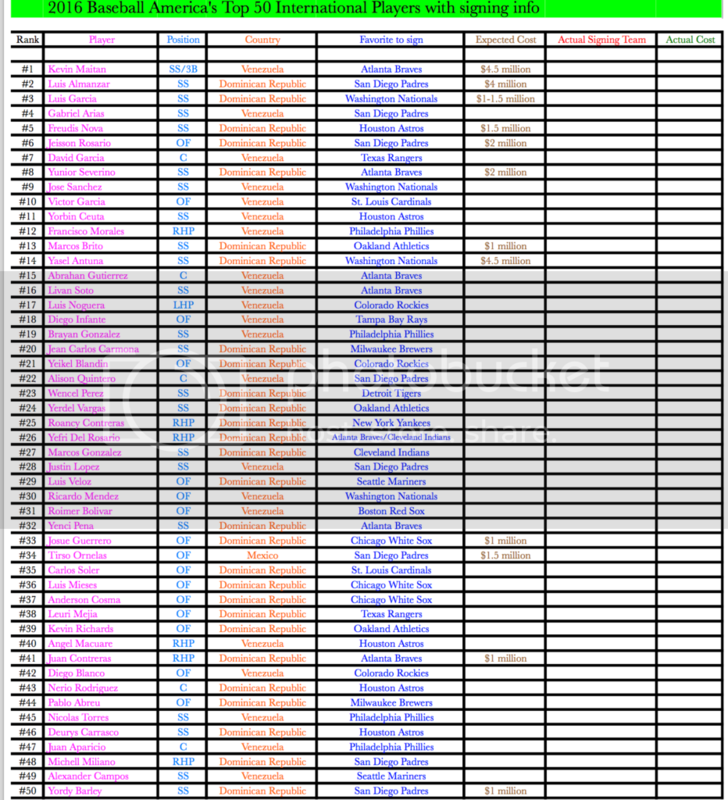 Here is a spreadsheet I've created with Baseball America's Top 50 International Prospect's along with the favorite team expecting to land them, position, and estimated bonus. If you have any info not already on here please feel free to comment or DM me and i'll put it in. I'll update it as soon as each prospect signs. Hope you guys enjoy and this is helpful! P.S- If anyone knows a better way to upload the excel spreadsheet (I just had to screenshot it) then please let me know! Thanks guys and enjoy!! I'll make you a table like I had in thr draft thread. You can update it after. "#July2Update Venezuelan top prospect SS Kevin Maitán sign with @Braves for a 4.1 millions bonus"
I can now rest easy knowing he's with the Braves officially. So where are we gonna move Maitan to? have the gnats signed Maitan yet? How soon will we see him play? Next year. They're signing contracts for the 2017 season. No idea but if his timetable is to arrive when he turns about 21, then maybe Swanson and/or Albies will be a year or two out from free agency. If he's as good as people say, i dont think he'll need 4 years in the minors. Just hope he doesn't burn us like Salcedo did... not that their talent is comparable, but I'll still never forget how excited I was about Salcedo. I didn't think he'd necessarily be a star in the majors but I thought he'd at least be a big time prospect. I know Seth beer is looked at as the next huge positional prospect. How does maitan stack up against beer? He's been compared to Miguel Cabrera (which is very high praise indeed). Cabrera played one year of short-season ball and two-and-a-half years of full-season ball before being called up by the Marlins from AA in 2003. That would probably be the rosiest projection for Maitan providing the Cabrera comparison is accurate. Miguel Sano played two seasons in rookie league ball (DSL, GCL, Appy) and was moving up very fast until he missed the entire 2014 season with an injury. Like Cabrera, Sano played two-and-a-half years of full-season ball m(2012, 2013, and 2015) before the Twins called him up from AA mid-season last year. While I hope Maitan moves fast, I also hope he doesn't pack on the pounds like Cabrera and Sano. Best case scenario would be rookie ball in 2017, A ball and A+ (with simply A ball being more likely) in 2018, AA and AAA in 2019, ready as starter at the beginning of 2020. If he's as good as advertised more likely he hits AAA at the beginning of 2020 and is ready for a midseason callup, It's extremely rare for international players to jump more than 2 levels a year. Mind you we did it with Albies this year (and rushed the crap out of him IMO), but he's not a big ceiling guy so it makes a bit more sense. Speaking of Seth Beer. If he transfers to a Juco school then we really need to tank for the #1 pick. I just copied and pasted the format from the Draft Picker thread. Just change names out and numbers. And BOLD all Braves signings.